In the incessant — but very important — debate over the future of the William F. Cribari Bridge, references are often made to the previous renovation, about 30 years ago. At that time, a temporary span was constructed just north of the permanent one. It took out a small gas station next to Mansion Clam House (now Parker Mansion). But it was — surprisingly — graceful, efficient, even loved. Many Westporters wondered: Why don’t we just keep it? It was a good question. And alert “06880” reader Ken Bernhard, who remembers it fondly, has another one: Was it made of wood? If you know — or if you have any other memories of the Brigadoon-like Saugatuck River bridge — click “Comments” below. 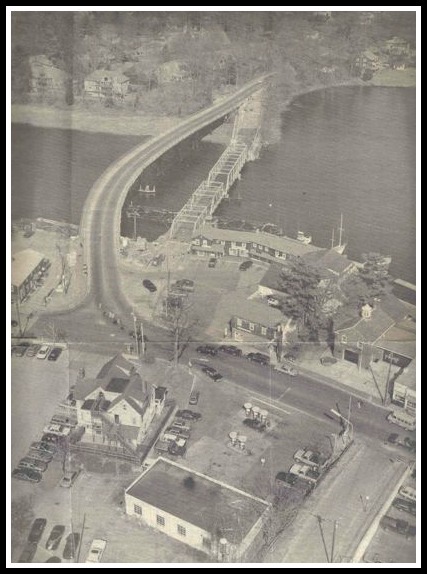 This entry was posted in Friday Flashback, Restaurants, Saugatuck, Transportation and tagged Mansion Clam House, Parker Mansion, William F. Cribari Bridge. Bookmark the permalink. The temp bridge was, as I recall, a kind of melange of used bridge parts; concrete and steel – and some duct tape. OK, maybe not the last one. I remember the bridge from 1992 when I first moved to Westport. Coming from Chicago, I wondered why anyone would want to go back to the inefficient, rusting and rickety bridge we have now (although it’s nice when it is decorated with lights). I remember the temporary bridge as a boring, basic and utilitarian concrete and beam overpass. I drove over it several times a day and always thought how ugly it was. I couldn’t wait for the old bridge to be back. But, it Was intended as, and was in actuality, temporary. I liked it better than the relic we keep trying to fix. Make that a pedestrian bridge and bring back our “span” permanently. Or, take out the old sterl bridge and foundation and put in a new one altogether. Save money in the longer run. I remember traveling west on the down hill part towards the stop light on an icy winter morning finding my car sliding just a little bit “interesting.” It might have been before I had put real snow tires on the car for the season. Maybe bring back that temporary style bridge for westbound traffic and the steel bridge for eastbound. Or add the second bridge and leave the steel one as a foot and bike bridge. Whatever the solution is, we do not want big trucks going over this bridge and through Greens Farms. Bridge Street could become a parallel I-95 and this would be a distaster. The picture doesn’t show the height of the bridge. It was very steep, not very safe in winter but it was fun to drive over (for some, like me). Something like this is the answer to the present need. More curve would make the height more gradual. The alternative is a bridge going all the way to Saugatuck Ave. as they originally planned. I sincerely hope that an alternative bridge going all the way to Saugatuck avenue is not what is planned. The destruction to Saugatuck would be devastating. I know this is not what Dan is asking but I have to caution. Please be careful what you wish for. Think about the type of traffic the temporary bridge allowed. Think of the type of traffic a new modern bridge would allow and then think about the historic area that would be inundated with heavy trucks and the loss of land a new bridge would require. Last but not least think about the environment. I remember the temporary bridge very well! Seemed to serve its purpose just fine. Can anyone recall the exact years it was up? I just have memories of early 90’s, but don’t recall the construction or tear-down of it. Did the temporary bridge swing open to allow river traffic? And do I remember correctly something about the renovation needing to be re-done to address complaints that the new beams below did not allow free-flow of small boats? The temporary bridge was tall (doesn’t seem so in the photo). The whole idea was to allow for the “rights of navigation.” Sailboats could go under it. That actually not completely true, the temp bridge was not high enough for sailboats (other then trailerable ones who can step the masts without crane support). Our yard lost all of its sailboat winter storage clients because of the temp span . Sadly after the new “old” bridge was installed the “short sighted” design issue chased out most of our power boat clients as well , Even after they “raised it” the clearance just wasn’t available with the current configuration,, such a cluster****. Its been a struggle for every marina upriver since and the results are obvious , easily 100+ publicly accessible slips empty north of the bridge. not to mention the private homes. Another part that I find interesting is the argument of stopping truck traffic thru bridge street, greens farm etc. This implies the Riverside , Saugatuck and downtown neighborhoods should bear all of the overflow from the interstate. Seems unfair as we all chose to live next to a major corrodoir. Lots of talk for the D.O.T’s plan for a replacement , what ive been shown is an exact replica as an option ( its online) , only modern part is the technology and materials but design is identical, sits a few feet higher for marina traffic. puts the vulnerable electrical components out of flood range , allows pedestrian and bikes safe passage and adds abit of width for cars. it seems foolish not to take the D.O.T up on its offer to fund this type of project. Not to worry, Yulee. Robbie’s way ahead of you on that suggested bridge churning idea. The DOT bridge folks don’t mind. They get time and a half. And the Town of Westport gets the bill. Why the latter, which is fully aware of the scheme, does not mind, is less obvious. Cut it out Morley ,we have you to thank for the last 6 weeks of closings every nite, all nite long, just to patch up the ascetic trusses not even a real repair, just bracing to keep it from falling on your head. The D.O.T doesn’t get time and half and the town isn’t billed , ask the pd as I have. Your to Blame concerning the traffic for the last 30 years and to be honest your pita antics are old. Good luck as the bridge is going down and a proper span that serves this community and looks old school will be in place. Now the east side will have to share the corridor over flow. its about time. Cheer up, Robbie. You should be thanking us all for paying your tab. Who pays for all the traffic control for the last 6 weeks to patch up the relic? that’s a bill. You won’t answer that direct question. why don’t you just own it… I mean its not so bad, you want it preserved and will let the local tax payer eat the cost.. no big deal… don’t just say you’ll stand up…. stand up! I find your concern for those who pay local property taxes interesting. Don’t accuse me of spending tax payer dollars with federal mandated access while you and your obstructionist force feed the town to endure months of overnite closings and huge fees just to support the relic astetic truss ,not even an actual repair. Mr. Sherman hit the nail on the head with his post, ty sir..
Again…. Stand up and own it….. you won’t thou and most know why. Yulee. I agree… its designed to swing, no problem for me. indulge me with a question….. what were the details concerning the span and is faulty design, if I recall a young engineer had some sort of say in its height, claiming it was actually higher? Before 1992 reconstruction the steel girders, supporting the bridge ran parallel to the river, allowing small boats to go between them without opening the bridge. The new design had them run perpendicular, blocking the small boats. Hence DOT paid us to raise the bridge to accommodate small boats. yes I recall that, Did the adjustment that the DOT had you do return the bridge to its original height? id love to see the documents in the law suit. if im correct the as -built’s just show what we have been stuck with…. but it would be great to revisit as not to repeat. I believe the crux of the lawsuit was after the the d.o.t and its team fumbled and reluctantly agreed to ” fix ” the huge mistake, they had one idea of a height adjustment and the fishing charter captains, marinas , private home owners and every daily boater had another. I for one know my center console at the time was able to pass between the parallel girders and even after the “fix” was not. Not sure what the survey numbers were but it sucked. still does. Id be interested to know your thoughts about the current configurations adequacy both marine, auto and pedestrian as well as its overall condition and what the course of action should be . I can’t speak for marine clearence since my job was to raise the bridge X feet and we did it. I would assume that the amount of the raise was at least the depth of the old girders. I would also say that the bridge itself meets design criteria in a very narrow sense of the code, hence I would imagine that the suit may not be won on the grounds that it’s too narrow with limited height clearence, load capacity, etc. This is unfortunate for me as well since, just like many of us, I use it daily and would like a wider structure w/o “historical” trusses, that are not “ cute and quaint” in my opinion. It was a fixed bridge with high clearence. It was built using steel piles, steel beams, wood crane mats as deck and asphalt wearing surface. It was wider and hence more appealing to motorists. It wasn’t however designed to serve as permanent bridge. I remember the bridge and thought it worked well and looked elegant, as you say, Dan. It did not swing open but was high enough for boats to pass under. I don’t know what the under structure was, but the surface was asphalt. I worked for the construction company that designed and built this temporary bridge. Oh please do, that would be fantastic to see, and certainly enrich the discussion. Can you tell us what makes a bridge “temporary” vs one suitable for permanent use? Not sure how to upload video. Id someone can advise, I’d be happy to do it. Yulee you can probably upload the video(s) to youtube. You could also do a trial membership at vimeo and upload it there. I well recall the temporary bridge, and the many calls for keeping it (alongside of the steel bridge) from Town residents – which was funny if you bothered to look at how it was built, with metal I-beams and wooden posts pounded right into the Saugatuck River bed (yes, with an asphalt roadway). Perfectly acceptable for temporary bridge purposes, but definitely not a permanent structure! You’re doing a fantastic job as usual. You may remember that my office window at 21 Bridge Square from 1965 to 1990 overlooked the river and the bridge. And I could never understand why they removed the “temporary” bridge. And, naturally, as soon as the old, traffic-clogging, bridge was “fixed” and reopened, and the beautiful soaring efficient “temporary” bridge was dismantled and removed, the traffic stopping jams came back; seemingly even worse. Along with dangerously Increasing stress levels, and possibly some heart attacks, among so many people unpredictably stuck in their cars, held-up by traffic, waiting to get to their trains on-time, or to pick-up family members on time. Many of us locals remember that the amazingly efficient, beautiful, new temporary bridge was removed primarily to satisfy the desires of people who did not use, or need to use, the bridge for themselves. But they felt noble and superior pushing their monopoly on esthetics and values by celebrating an old unworkable, unsafe, antique bridge, because it reminded them of simpler times long gone. Even the fact that emergency vehicles, rushing in either direction, possibly to save-a-life, are often slowed to a crawl, or stopped in their tracks completely, doesn’t seem to weigh-on their sensitivities. So how about the following idea that we can all support? Just for the record, I did not like the temporary bridge and believe the preservation of the historic bridge, with its positive impacts upon traffic calming, prevention of large trucks and as a disincentive to more vehicles, combined with the pure historic preservation issues, as well as for many, its quaint charm, support the efforts of so many in Town to preserve the Cribari Bridge. What is wonderful about the William Cribari Bridge is not only how the history is related to actual Westporters who donated land, protected property rights, established neighborhoods but also maintained an aesthetic gateway to the residential neighborhoods on Imperial Ave, South Compo, Greens Farms Road, and the Longshore and Compo basin/beach area. The historic and aesthetic presence of the Cribari Bridge bridges (as the 19th century Westporters intended) joined the residential and commercial aspects of Westport. That a slippery, makeshift temporary bridge moved traffic but diminished the quality of life for the Westport citizens who lived in these neighborhoods… so what? A Westport native, I returned permanently in 1991 after years of living away and I was delighted with the temporary bridge for all the positive reasons mentioned above. The original metal grid deck always scared me especially when I was a newly minted driver and the narrowness can still be nerve wracking. I am not sure how one considers a traffic-jam-causing bridge to be traffic calming. I wish we could have the ease and graceful lines of that temporary bridge with design elements that would prevent big trucks from using the route as a shortcut. At peak traffic hours, the old bridge is not a disincentive to cars – it just makes traffic slower. There are only three routes across the river and each of them are clogged at peak hours. Agree and had similar thoughts/questions in my mind as to the lack of historic pictorial evidence, construction timeline and demo, regarding the temp-bridge. I recall, as someone earlier had mentioned, that the incline route from Saug to Greens Farms road (or, Green’s, LOL) was seemingly steep at first, then rounded out to a less severe downward back towards land.